LATAM Airlines Group is making adjustments to its international network in late 2014 and 2015 as the macroeconomic conditions in some of its home markets remain weak. The changes also reflect the group's ability to leverage the combined fleets of LAN and TAM post merger as LATAM continues its efforts to shed inefficient aircraft as it phases out 39 jets during a two year period. LATAM is increasing frequency to North America and adding service to Europe even as it has cited some pressure in those markets during the last year. But the company appears wisely to be selecting markets that are largely shielded from competition that could help deflect any lingering economic weakness within South America. 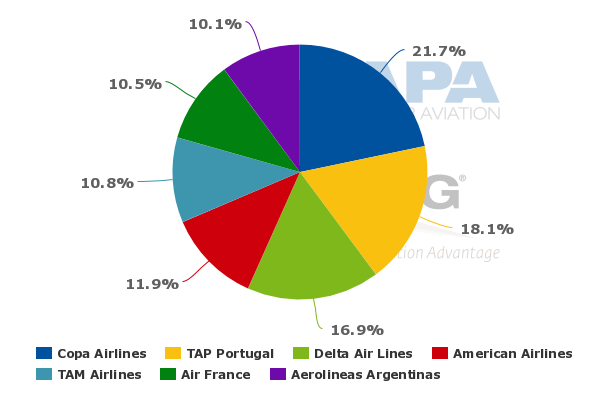 LATAM Airlines Group is adding new flights to the US and Europe in late 2014 and 2015 after ASK growth in its international markets – long-haul and regionally within South America – is projected to decrease 1% to 3% in 2014. In late 2012 LATAM cited some weakness in its long-haul markets after it bolstered service from the US and Brazil along with American Airlines and United Airlines. At that time it also initiated a long-haul revamp in Brazil to centre most of its long-haul operations at Sao Paulo Guarulhos. As a result LATAM cut service from Rio de Janeiro to Orlando, Frankfurt and Paris. Beginning in 2013 and throughout 2014 LATAM has battled currency devaluation in most of its Spanish speaking countries. At the end of 2Q2014, the company estimated a 14% decline in Chile’s currency and a 54% drop in Argentina’s currency as Argentina faces the fallout from defaulting on loans. Company executives also highlighted that GDP growth targets for Brazil, Chile, Peru and Argentina have been revised downward. For 2014 the IMF projects GDP growth for Latin America of just 2.5%. While it continues to face weak economic conditions within South America, LATAM has opted to launch new long-haul flights from Sao Paulo to Barcelona in mid-2015. The new route is relatively low risk as Singapore Airlines operates between the two cities as part of its Singapore-Barcelona-Sao Paulo routing. Schedules in CAPA and OAG show that Iberia ended flights between Sao Paulo and Barcelona in late 2012. LATAM’s new service could pressure Singapore Airlines’ flights, and may force the airline to find another stop-over for its service to Sao Paulo. Singapore Airlines (SIA) currently operates three weekly flights on the pairing. SIA does not have the benefit of offering connectivity to TAM's network throughout Brazil and South America since TAM exited Star in early 2014. LATAM has cited strong demand in Brazil for its flights from Sao Paulo to Spain’s largest city Madrid, which is also served by fellow oneworld partner Iberia. LATAM is betting that it can leverage demand for the new service to Barcelona during the high travel season in Brazil. The company can also market the new service throughout South America with its combined network, which enlarges the passenger base for the new service. Aerolineas Argentinas and Avianca are the only other airlines offering flights from South America to Barcelona with service from their hubs in Buenos Aires and Bogota. LATAM is also marketing a Santiago-Sao Paulo-Milan routing to join TAM’s existing daily service from Guarulhos to Milan. The company states that LAN will operate the daily Santiago-Milan flights featuring the stop-over in Brazil in order to broaden connectivity options for passengers throughout South America. LAN plans to operate Boeing 787 widebodies on the pairing versus the less fuel efficient Airbus A330s TAM presently operates from Sao Paulo to Milan. LATAM is in the process of shedding less efficient models from the combined fleet, and at the end of 2Q2014 had redelivered seven A330s along with one A340, five Boeing 737s, two Q400 turboprops and one 767 freighter. By the end of 2015 LATAM projects operating just four A330s from legacy TAM, and expects to phase out TAM’s A340-300s/500s. LATAM is also leveraging its strong position in Brasilia in 2015 with the launch of new flights to Orlando International Airport. Brasilia is Brazil’s fourth busiest airport measured by passenger numbers – approximately 16.5 million in 2013. But it is a predominantly domestic airport with only 3% of its seats deployed in international markets, and roughly 16% of its ASMs dedicated to international markets. 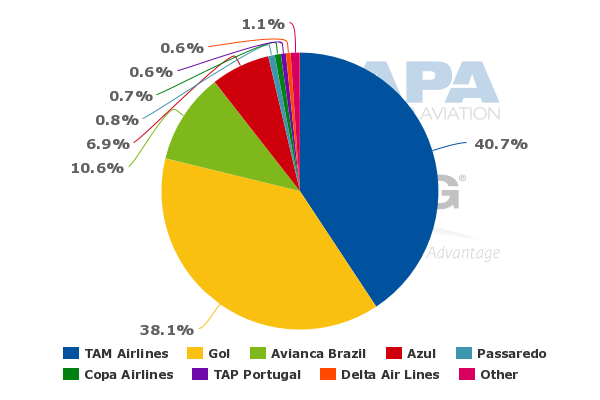 Schedules in CAPA and OAG (29-Sep-2014 to 5-Oct-2014) show that Brasilia has service to five international destinations – Atlanta (operated by Delta), Miami (operated by American and TAM), Lisbon (operated by TAP), Panama City (operated by Copa) and Buenos Aires (operated by Aerolineas Argentinas). On a system-wide basis, TAM occupies a nearly 41% seat share at Brasilia, but only approximately 11% of the international seats deployed from the airport. The addition of the Brasilia-Orlando flights follows service reductions by TAM to Orlando during the past couple of years including the elimination of service to Rio de Janeiro and frequency reductions from Sao Paulo to Orlando. So the new service will not bring TAM’s capacity to Orlando up to historical levels. Even as Brazil’s economy remains tenuous, the country’s domestic air traffic grew at a steady 5.6% rate during the first eight months of 2014 on roughly flat capacity growth. International traffic increased almost 4% despite a 4% capacity decline led by TAM, whose ASKs dropped 6% year-on-year, while Gol’s ASKs increased 6%. LATAM is rounding out its international adjustments with TAM tagging on service to Toronto from on its Sao Paulo-New York JFK pairing. LAN has operated a similar service in the past, but now the combined LATAM has an ability to access feed not only from Brazil, but also from Chile, Peru and Ecuador, which should provide demand on the continuing service to Toronto. Star Alliance airline Air Canada offers daily service from Toronto to Sao Paulo, but with the loss of feed from TAM, Air Canada’s network offerings in South America have decreased. TAM has no offerings beyond Toronto; but no other South American airline operates flights to Toronto Pearson. Panama’s Copa Airlines operates four weekly flights from Tocumen International to Toronto with convenient connections throughout South America and Avianca operates service from San Salvador. TAM’s new flights offer another connecting option in South America and could create some pressure for Copa, which very effectively leverages Tocumen’s favourable geography to offer connections from North America to Central and South America. The Mexican leisure destination of Cancun becomes a new destination for TAM at the end of 2014 when it launches new service from Sao Paulo. Cancun’s popularity with international tourists is reflected in the airport’s solid 10% passenger growth year-on-year from 2012 to 2013 to 16 million. Cancun has also recorded strong domestic growth as many of Mexico’s airlines have added new routes from the airport. LAN currently offers daily service from Lima to Cancun, and TAM’s new flights will be the only direct service from Sao Paulo to Mexico’s biggest resort destination. LAN also offers service from Santiago to Cancun once per week while Aerolineas Argentinas operates flights from Buenos Aires to Cancun and Avianca serves Cancun from Bogota and San Salvador. The distance from Sao Paulo to Cancun is roughly 3,557nm, and given Cancun’s high leisure bent, it is likely that TAM will operate a low frequency flight pattern on the new service. But with no competition, low frequency service and the appeal of Cancun’s resorts, the route seems a low risk proposition. LATAM is also increasing frequencies from Brasilia to Miami to seven weekly by 3Q2015 and increasing Santiago to Miami from 10 weekly flights to 14 during the next year. Miami is the main Latin American gateway for LATAM’s oneworld partner American Airlines, so the increased connections should benefit American, which can market more service options from Miami while LATAM can leverage American’s dominant position in Miami. 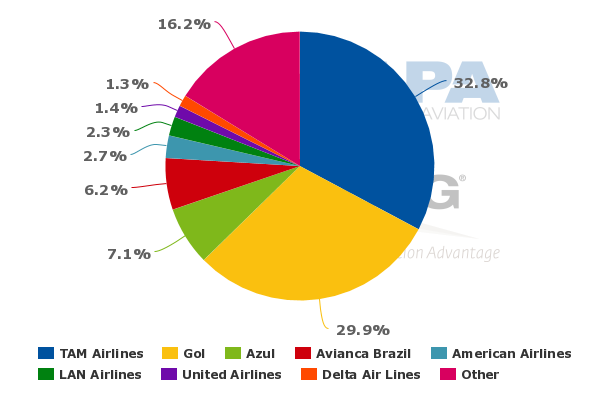 TAM’s international market share among Brazilian carriers dropped from 88% to 85% year-on-year during the first eight months of 2014, while Gol’s increased from 12% to 15%. After cutting some long-haul international capacity from Brazil, TAM may now conclude the timing is favourable to add some new flights from Brazil with more efficient aircraft that feature an updated product including the all important lie-flat business class seats. 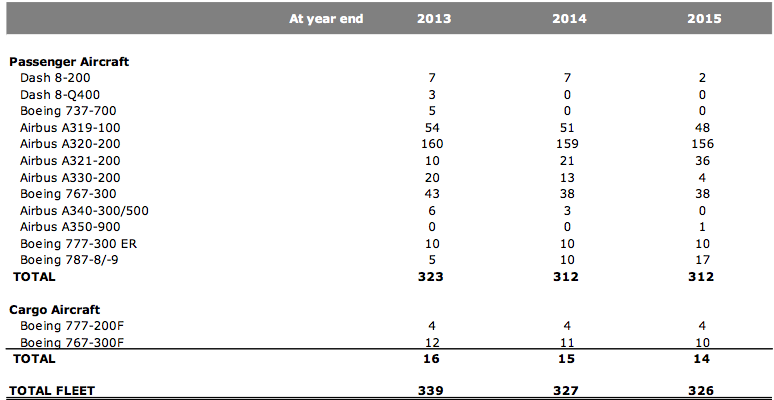 LATAM’s international expansion starting in late 2014 and continuing through 2015 seems logical. The airline aims to leverage younger more efficient widebodies for the new service offerings. It has been consolidating some long-haul service in Sao Paulo, so the latest additions and changes at its Brazilian hub reflect its strategy of exploiting its leading position at Brazil’s largest airport. The company is avoiding heavy competition in the new markets, which should help LATAM quickly build up solid passenger bases on the new pairings. One risk is ensuring adequate point-of-sale demand in the origin markets given Latin America’s still fragile economy; but with the merger, LATAM has more network breadth to leverage and a larger pool of passengers to access for its new routes. Latin America’s GDP growth is expected to expand to 3% in 2015. But it is not clear if demand within the region will increase at the same pace as GDP. Even with slight economic improvement, some consumers may wait until a more marked recovery occurs before resuming travel with any regularity. This creates some challenges for LATAM and all of the region’s airlines. But it is unlikely LATAM’s overall capacity growth will differ dramatically from the flat to 2% increase planned for 2014. By keeping capacity in check and launching new markets shielded from competition, LATAM seems to be making useful – but sufficiently guarded – moves to withstand any lingering weakness within Latin America.